Wooden steps leading into a bunker, like those in the photo, are artificial and are therefore immovable obstructions. So how does a player proceed if their ball comes to rest on one of the steps, or lies in a position where there is interference by the steps to their stance or area of intended swing? … or (b) Under penalty of one stroke, outside the bunker keeping the point where the ball lay directly between the hole and the spot on which the ball is dropped, with no limit to how far behind the bunker the ball may be dropped. Note that choosing the first option for relief (a) does not incur a penalty, whereas the option of dropping outside of the bunker, on the line from the hole through where the ball lay (b), incurs a penalty of one stroke. I always recommend that before players lift their ball to take relief under the Rules, they should work out exactly where they are permitted to drop their ball. In many cases this might be in an unfavourable place, resulting in a more difficult shot than they were originally faced with. 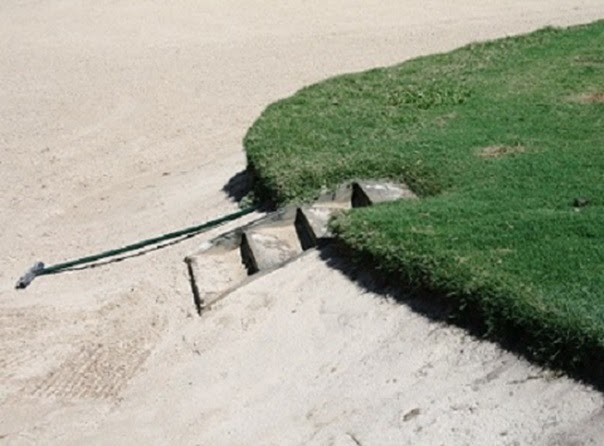 In the circumstances above, it is possible that a player may lift their ball from the sand close to the bunker steps before realising that the only point that they could then drop it within the permitted area meant that their backswing would be impeded by the wall of the bunker. Decision 24-2b/5 clarifies that if a player lifts the ball to take relief without penalty under the first option above, but changes their mind, they may then elect to proceed under the second option and drop their ball outside of the bunker for a penalty of one stroke. With Masters 2014 at Augusta beginning on April 10th, this is a great time for golfers to brush-up on their understanding of the Rules of Golf. There is no better way than to test yourself using my eBook, ‘999 Questions on the Rules of Golf’. Purchasers (€9.99 / €8.99 / £7.79) receive two files, which permit downloading to tablets, computers, smart phones and eReaders, so that you may carry it with you wherever you go. Click here for details. Grateful for your comments on 2 problems I encountered recently. 1. On a long par 4, a player's second shot landed in a green side bunker where it embedded near the wall. In attempting to get to his ball from the high end of the bunker , the player slipped causing sand from the wall of the bunker to cascade down burying the ball several inches deep. What are his options? 2. A player's ball was on his opponent's line of putt on the green and was asked to move his marker. The green was damp after a recent shower, and while attempting to relocate his marker his putter slipped knocking the marker ( coin) a foot or so away. He replaced the ball correctly and played. Is there a penalty? 1. Presuming that the ball did not move the player did not incur any penalty. He was permitted to move sand in order to find his bal. Having found his ball he must re-create the lie as nearly as possible by replacing the sand that was moved. If the ball is moved during the touching or moving of sand while searching for or identifying the ball, there is no penalty, but it must be replaced and the lie re-created leave a small part of the ball visible (Rule 12-1a). If the player decides not to play his ball because it is too deeply embedded in the sand, he may deem it unplayable and choose one of the three options in Rule 28, for a penalty of one stroke. Note that options b and c require that the ball is dropped in the bunker, not nearer the hole. … any accidental movement of the ball or the ball-marker which occurs before or after this specific act, such as dropping the ball or ball-marker, regardless of the height from which it was dropped, is not considered to be "directly attributable" and would result in the player incurring a penalty stroke. If you enter "Ian Poulter" in the 'Search This Blog' box in the top right corner of this blog page, you will see that he was guilty of a similar breach in November 2010.